A team from the 82nd Aerial Targets Squadron supported F-22 operational tests of air-to-air missiles against an aerial target April 18, 2017 at the Utah Test and Training Range outside Hill Air Force Base, Utah. The Raptors, assigned to the 412th Wing at Edwards AFB, Calif., launched inert AIM-9 and AIM-120 missiles against multiple BQM-167A sub-scale aerial targets as part of a major capability upgrade. The F-22 completed operational tests of air-to-air missiles against an aerial target April 18 at the Utah Test and Training Range as part of a major capability upgrade. The Raptors launched inert AIM-9 and AIM-120 missiles against multiple BQM-167A sub-scale aerial targets, marking a significant effort along the 3.2B initial operational test and evaluation upgrade timeline. The jets are assigned to the 411th Flight Test Squadron, 412th Test Wing, Edwards Air Force Base, Calif.
A team from the 82nd Aerial Targets Squadron deployed from the 53rd Weapons Evaluation Group, Eglin Air Force Base, Fla., to provide the flying targets in the missile tests. 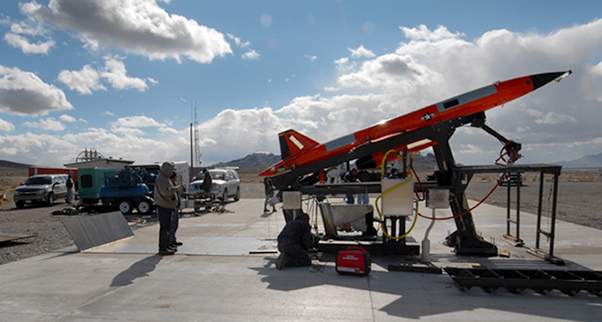 “We deployed a group of 15 active duty members, government civilians and contractors to launch, fly and recover up to eight BQM-167A targets over three days,” said Lt. Col. Matthew Garrison, 82nd ATRS commander. The 3.2B modernization update to the F-22 is the jet’s biggest capability upgrade since reaching Initial Operating Capability in December 2005. Once fielded, it will add capability boosts to U.S. Air Force air superiority and further support coalition efforts downrange. “Because we are the only Air Force unit with the aerial target mission, we take our responsibility for developmental and operational flight testers very serious, including deployments to meet them on their local ranges,” said Garrison. The 3.2B incremental upgrade is projected for IOT&E through Spring 2018. The 82nd ATRS is a geographically separated unit of the 53rd Wing headquartered. As the sole operational test wing for the U.S. Air Force, the 53rd Wing develops, test, evaluates, and delivers effective and sustainable combat capabilities to perfect lethality and survivability of the nation’s combat forces.